This facility would not only house inmates, but also the sheriff and his family. According to accounts, the original jail was not only an eyesore, it was within view from one of Flagler’s luxurious St. Augustine hotels. Flagler, being the businessman that he was, knew that guests would not want to see a jail while vacationing in the beautiful city of St. Augustine and that such an event would diminish their experience at his hotel. He was compelled to relocate the jail by constructing a new building that would better resemble the many other magnificent structures in the area. And so, the Old Jail was built as it stands today. Built in the Romanesque Revival style, St. Augustine’s new jail looked like any other house during that time period, and aside from the fact that it had bars on the windows, no one would ever guess it was a jail. During its lengthy service to the city, the Old Jail housed both male and female inmates and was the city’s only jail for more than 60 years, remaining open and operating until 1953. 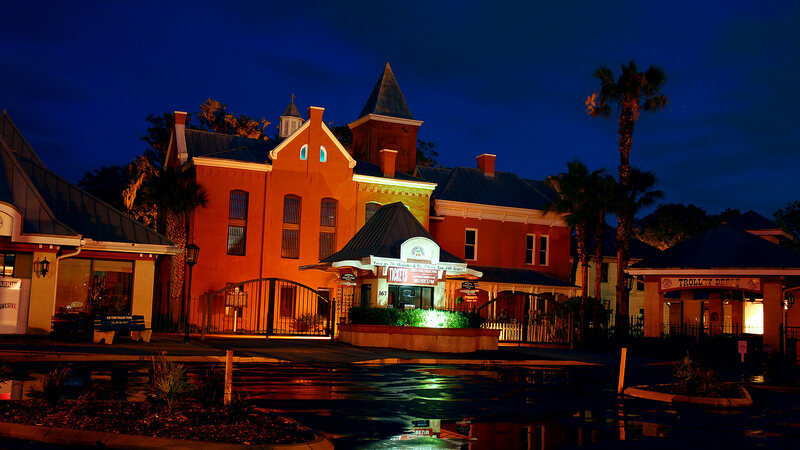 Today, the Old Jail is a fun and interesting local attraction where visitors to St. Augustine can learn about its fascinating history. But there’s a dark side to this seemingly harmless building – and this is the side that lures in paranormal experts and ghost enthusiasts from all over the country. For it’s what transpired within the walls of this lovely Victorian building that caused the Old Jail to earn its alternate reputation as one of the most haunted spots in the ancient city. The walls of the Old Jail were 20 feet tall and so thick that no sounds could transcend the cells and be heard by outside ears. The windows didn’t have glass and the concrete and metal made for a very cold, sterile environment. And while the sheriff’s quarters were comfortable and well appointed with all the necessities for he and his family, the male and female cells were far from that. In fact, by today’s standards, they would be considered unlivable for humans. No blankets or pillows were provided and the mattresses, stuffed with Spanish Moss, were often infested with red bugs. And shocking as it may seem, the Old Jail had no bathing facilities or sanitation for human waste, which meant the inmates were not able to bathe and there was a stench that could not be eliminated. As one may imagine, there was much sickness and death in the Old Jail – even beyond the executions that took place during that time period. The maximum security cells, located in the back of the building, were equipped with stockades, a torture cage and a clear view of the execution area. The solitary confinement cell had no bed at all. The inmates that were incarcerated in the Old Jail were the worst of the worst when it came to criminal activity. Both the men and women were convicted of nefarious crimes and many of them did not survive their sentences. And although they were horrific people, the treatment they received was less than humane in many instances; there were beatings, tortures and starvation. The experts believe that these events caused the spirits of the inmates and several others to linger within the Old Jail, offering explanation into the many mysterious and inexplicable events that occur today. One of the many complaints to those living close to the Old Jail is the frequent sounds of footsteps walking inside. Loud, clunky noises indicate that these footsteps belong to the disembodied souls of the criminals that once lived and died there. Guests touring the facility have also reported this phenomenon. At any given time, visitors and workers at the Old Jail sense the aroma of sewage in the air; although there is none to be found on site. Others report a sickeningly sweet smell, which many describe as that of molasses boiling on a stove. But despite the daily cleanings and air fresheners, these two aromas seem to linger, just like the ghosts. Although dogs once lived at the Old Jail, there are no furry residents living there today. Even still, it’s believed that the reported sounds of dogs barking belong to these long lost pooches, which were family pets of the sheriff from centuries ago. It probably comes as no surprise that those who tour the Old Jail hear voices in the cells and hallways. There are many reports of wailing, moaning sounds coming from the maximum security and solitary confinement areas and some visitors have even reported hearing the voice of a little girl coming from the sheriff’s quarters. Others have heard someone whistling at them; and several guests have reported hearing a dastardly laugh in one of the women’s cells. Haunted places often have areas that people describe as cold spots and the Old Jail is no exception. There have also been many accounts of people feeling as if someone with a cold hand is touching their shoulder. Other reports from visitors include the sensation that someone is tugging at their hair and that someone is blowing on them as they walk by.